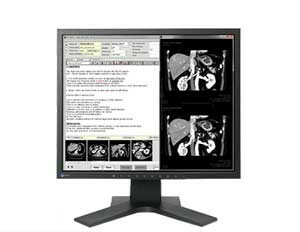 19-inch, 1 megapixel monitor with DICOM Part 14 calibration for viewing DSA, CT, and MRI. Image Clarity with High Contrast The MX194 adopts a high contrast VA panel allowing images to be viewed with clarity. With deep blacks, contrast between colors is significant for clear reproduction of color images. Gain Smooth Color Reproduction The monitor can support 10-bit input for each RGB color, displaying more than one billion colors simultaneously. This ensures accurate reproduction of color tones for 3D color rendering and image fusion. 10-bit color graphics board and 10-bit color viewer software needed for 10-bit color display.